This is probably my favorite photograph of all time. 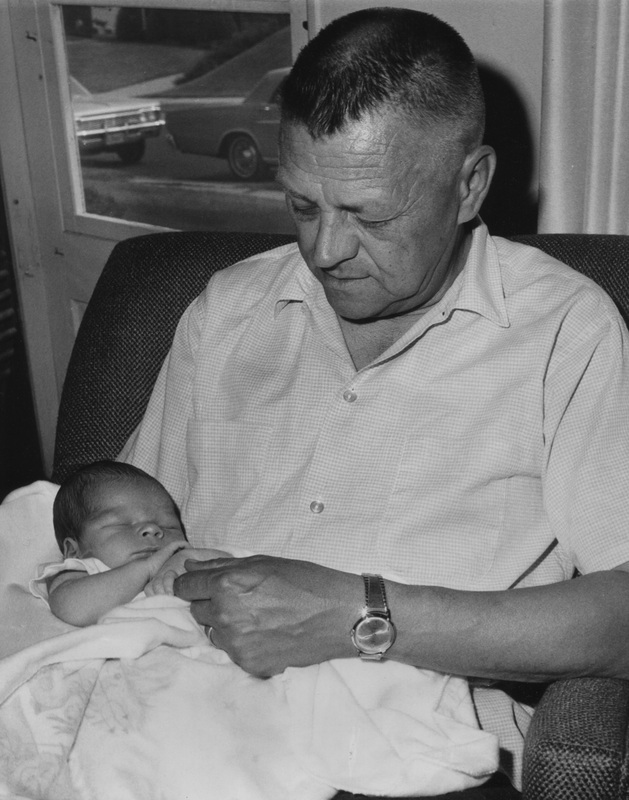 Meet my grandfather, who is holding me shortly after my birth in 1967. Grandpa was an engineer, and he and Grandma were living temporarily in Seattle while he worked on a project. They flew back to South Bend just in time for my birth. Shortly after Mom came home from the hospital, her entire family came to the house to meet me. A great uncle took this photograph. That’s the short of it. The long of it is more interesting. Years later, Grandpa admitted that they went to Seattle because he had been invited to work on the space program. He wouldn’t elaborate, but Grandma whispered to me that he had designed the landing mechanism for the Apollo 11 moon unit. Grandma was proud of Grandpa and tended to inflate his accomplishments a little bit. She used to say that half the trains in America stopped on his brakes, and half the airplanes around the world landed on his landing gears. So all I really know is that Grandpa played some part in the space program. But that’s exciting enough! I cling to this image because my grandfather was a hard man to know. He made up for it by doing lots of things with me while I was a boy. He taught me to bait a hook and cast a line; I spent many happy hours silently fishing alongside him. He’d take me along when he’d “run up to Phil and Ann’s,” which was a little general store out in the sticks where he and Grandma had retired. There he’d always buy me a balsa-wood airplane or a pack of mints. With Grandma, he even took my brother and I on a long vacation up the eastern Lake Michigan shore, all four of us riding abreast in his pickup truck. It was the first and last time I heard him say it. When I saw him next, at Christmas, he was unconscious in ICU, slipping away. He died just after the new year. As hard as I cling to this photograph, I cling even harder to his last words to me. What a beautiful photo and story. Brought tears to my eyes. Interesting that you have photography in your genes. And it would be fascinating to learn precisely what your grandfather’s contribution to the space program was… must have been a brilliant man. And also loving… sad to move ahead in life and realize these memories are falling farther and farther behind. Thanks Jennifer. He had his shortcomings — a little self centered, a little too much drink — but his family really mattered to him. True to his generation, he showed it by doing things with us rather than telling us. I have always wished he had held on long enough to see me graduate from engineering school. That would have been special for him. Sometimes when you look back at these people in our lives it’s interesting that their outdated ways… times in which they lived… does nothing to change our special feelings about them. It’s like they get a free pass. Times have changed so much. Don’t you just sometimes wonder how much he’d love your kids… and be able to show it? Or what he’d think about technology? I think it’s because your memories are tied to that outdated time, too — it’s the context in which your memories live. Grandpa always had all the latest gadgets. He always passed them off to my brother and I when he was done with them. I had a programmable calculator in 1985, when they cost several hundred dollars. So I’m pretty sure he’d love the Internet. He’d probably have an Apple TV box and stream Netflix. ps. The photographer uncle married in. He was my grandfather’s sister’s husband. …and have only one memory of one of my grandmothers. So it’s a wonderful story Jim. Our cameras, photographs, and memories intermingle with one another. Keep writing your blog posts, we’ll keep reading them. I only had the one set of grandparents. My dad’s parents both passed before I was born. But the one set I had certainly gave me the full grandparent experience. The clinging and holding on to what we have, to somehow represent that which we will never know. I understand that. Tina, you summed up this whole post in one sentence. A very moving story that brought a tear to my eye. We’ve all had experiences like that. I came back to Indiana partly to spend time with my Dad while I still had the chance. I didn’t want to get “the call” when I hadn’t seen him for six months. The night before he fell ill, we had our regular Sunday family dinner and I brought takeout from Stanley’s Deli, which he enjoyed. He’d had minor back surgery on Friday and needed help getting out of his chair. My brother Steve and I took his hands and helped him stand up: his grip was strong as I held his hand: He always had a very strong grip. I’ll remember that moment as long as I live. During the night, he fell ill and never recovered. He lingered for another 12 days and then went to what I know was a hero’s welcome in the next world. Politics, economics, individual accomplishments — all these things mean so little compared to moments such as remembering the last time your father gripped your hand. Clearly, Grandpa always loved you. Some men, I know from personal experience, find it much harder to say “I love you” than it is for them to show love. You rightfully cherish the words. I think Grandpa was of “that generation” that was not touchy-feely, not expressive. They had a war to win, and an economy to build; he focused on those things and found his esteem through them. It flavored all of his relationships, expressed through his behavior. Nice memories Jim! We always hold close to our hearts people like this! They never leave us in spirit. And we never let go. We just move on. You hope that you leave your kids with the same type of memories and that you’ve provided them with the same love you were given when you were growing up. And that they will fondly remember your words as well. I’m a word person, so my kids should have plenty of word memories from me! One of my grandpas ( my mom’s pa) died, long before we, all of us siblings, were born. The other died while I was still an infant. But I have learnt a lot about the foemer, through my papa, who was a fond admirer of his father-in-law. And about the other, through my mother, who adored her pa-in-law. Thanks, Jim, for a great story. The nice photograph reminds me of a photo of my papa holding my less-than-a-month-old, twin grandkids, carefully. It was taken by me a few months before he left us. I envy you your relationship with your grandfather, Jim. That’s something you either get in your life or you don’t, and you did, and it sounds sweet. This just goes to show that it’s all relative, because I basically wrote a post about how it was hard to have a relationship with my grandfather. But I guess having him in my life at all was better than the alternative. My grandparents were alcoholics. Functional ones who got up and went to work no matter how hung over they were, but alcoholics nonetheless. You wanna talk about salty — just get some wine into my grandma and get her to talk about the old days. Hoo boy. Your narrative is really beautiful, as are the memories you chose to share with us. The photograph is gorgeous… the warmth and love as your grandfather holds your hand and can’t take his eyes off of you. Thank you so much for saying so. And thanks for stumbling upon this old post, as it is one of my favorites. I love this story! Thanks for sharing it with me.